Each year just before the PGA Show in Orlando, my main shaft supplier, ACCRA Golf Shafts, hosts a day-long event of product information, shaft testing and 18 holes of golf. As I was watching golfers hitting on the range and out on the course, it occurred to me that most golfers do not have a proper sense of how far they hit the ball with the various clubs in their bags. I think most golfers have a sense of how far they hit their driver, given how solid the hit was, what the weather is like and the firmness of the fairways, etc. Knowing how far you hit your driver is good knowledge to have, but it is not critical knowledge. Whether you hit the ball +/– 20 yards is not going to have much an impact on the outcome of your game, i.e., your score. After all, if you hit it a distance that is close to your potential and is in good shape for your next shot, then it is mission accomplished. What about your more lofted fairway woods, your hybrids, irons and wedges? These clubs are generally your approach clubs. With these clubs you absolutely need to know how far your carry distance is. Without this knowledge good course management is impossible and can lead to extra strokes incurred in your score. The carry distance you get from any given club is determined by the ball speed, launch angle and spin rate. These three factors will then have a direct effect on such thing as maximum height or apex, landing angle and spin axis. Professional golfers know within a yard or two how far they hit each club. They have the skill and ability to hit the ball very consistently. Even still, they make mistakes and come up short, in a bunker, or go long over the back of the green. For the average mid handicap player, he or she will generally hit their clubs +/– 10-15 yards and generally overestimate how far each club carries. So how do you get the necessary knowledge needed to manage your round of golf? Going to the driving range and hitting balls hoping to get distances is virtually impossible. For starters, the range balls do not fly as far as a regular premium ball and there is no way of knowing where the balls land. It is impossible to tell with the naked eye. Our depth perception is just not that precise. Also ranges, for the most part, do not have enough targets with varying distances to shoot at to tell us how far the ball has gone. The only way that you can get an accurate distance measurement is with a launch monitor. The launch monitor will track the flight all the way from impact to landing with total accuracy. 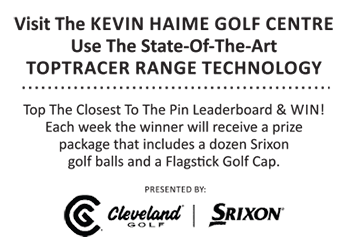 I use the Trackman 4 system because I fit indoors and I know that the results are within a margin of error of around 1%, i.e., 99% accuracy. By using Trackman, I can determine exactly how far the ball will travel on a solid hit. And just as important as it is to know this distance, it is equally important to know how far the ball travels on impacts that are less than solid. Again, this is critical information. For example, you are playing a round of golf and you have just hit a good tee shot, so you are in good shape for your approach shot. You have 147 yards to the pin, which is center of the green and there is a sand trap across the front of the green, 10 yards from the pin. So, you think to yourself, perfect! My 7 iron carries 145 yards. I can get really close with my 7 iron and maybe one putt for a birdie. You make a good swing, you contact the ball but oh-oh, it did not feel solid! And you watch your ball drop right into that sand trap. This is where the critical information you needed was this: what percentage of the time do you hit your 7-iron solid and what percentage of the time is it an off-centre hit and what distance are you likely to get with an off-centre hit? In this scenario it may have been better to pick a club that gets you beyond the pin if you do not have a high percentage chance of making that shot with your 7 iron. Knowing what your distances are will improve your course management tremendously. This a great thing to do with your clubfitter. Getting to know the maximum carry distance and range of distance for each club can only lead to better golf.